This is a caffeine-free chai version, based on the Chai recipe Sarah posted last year - which in turn is a recipe she inherited from Pia, so we're going full circle here. We used to buy a rooibos chai mix at a local Indian supermarket, but this version is much better (if I say so myself), and will definitely become a staple on our tea shelf. Grind the spices in a mortar or grinder until you have small pieces (not powder). The cardamom pods, albeit flattened and freed of the seeds will remain mostly whole, as seen in the image. Enjoy the delicious smell, it's part of the fun! 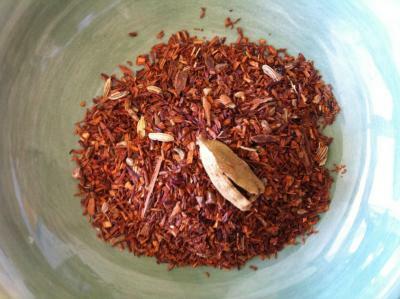 Spoon the spices into the rooibos tea and mix as you go. Transfer the mix into a tin or jar where it is protected from light and air and remains fresh. When you use the mix, measure out a teaspoon per cup - make it a heaping one for large mugs. It helps to contain the mix in a sachet or tea strainer. Add a slice or two of ginger root, and pour boiling hot water over the mix. Let steep for 5 min, add honey or sugar to taste, and top off with frothy milk or soy milk. Tip: Ginger root keeps for months in the freezer, and it is relatively easy to slice off pieces from the frozen root with a small knife. Fresh or frozen ginger is orders of magnitude better (and retains its healthy properties) than powdered ginger. Hat tip to my brother-in-law Mario.